Who would आप go out with out of thesse? As आप all(FUNS)know,in the end of Kingdom Hearts 2,Roxas return to his original form,which in this case is our beloved Sora.As I read the scenario of kingdom hearts III(which is totally awesome द्वारा the way,THE GAME ROCKS)Roxas return in some way in the dreams os Sora as his conscious,by it seems that Sora doesn't really remember him.Anyway!we meet the two boys fight side द्वारा side the heartless in the "Garden of Serenity"(is the dark place withe glassed platforms,by the way,for the funs that didn't know). 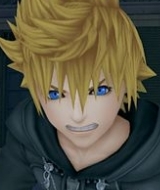 what dose roxas think of you. well here's mine Your Result Congrats! Roxas would SO प्यार you, he would stay with आप forever and for always, he is such a romantic guy! Roxas and Ventus BOTH represent Light and Darkness. द्वारा their clothes and personalities. And lots of other things. LOTS of great प्रशंसक कला of our Roxas! a comment was made to the poll: Do आप think he will appear in Kingdom Hearts 3? a comment was made to the poll: Do आप want Roxas to be a Somebody? What is the newist game called with roxas in?